I've suggested reading the Madeline book series by Ludwig Bemelmans before, but since it's Movie Monday, may I also recommend the films? There are the animated films, available in a boxed set of 7 DVDs, which expose youngsters to a little bit of French and Spanish vocabulary and are delightful for children as young as one year. 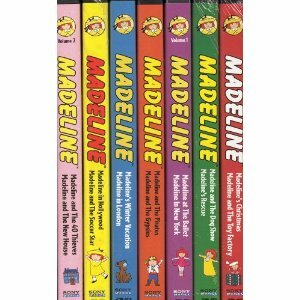 There are 14 stories on the DVDs which provide nearly 6 hours of Madeline entertainment. Meet Me in Paris is another favorite of mine, which for some reason is not included in this boxed set, but introduces kids to the city of Paris. 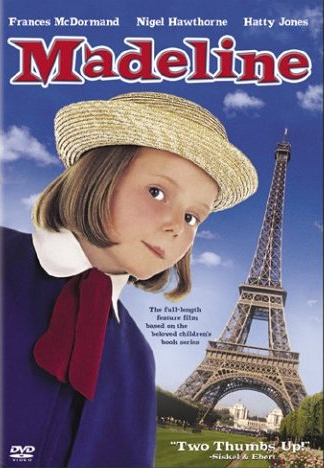 For more Madeline fun there's also the 1998 live action Madeline movie starring adorable Hatty Jones as Madeline and Francis McDormand as Miss Clavel. It's a sweet movie with fun adventures and positive messages, especially for young girls. Watch the trailer here to see if it's appropriate for your children, since it is rated PG. Thanks for stopping by Kelly's Lucky You. I'm a new follower - love your blog. Do you have a way to subscribe by email? Thanks for your sweet comment on soultravelers3.com! We've been traveling the world as a family non-stop for the last 5 years and spent MUCH time in Europe so we have much in common! Love these movies and books! Loved Madeline :). Happy Tuesday Girl. @Kelly's Lucky You: I now have a "subscribe by email" icon in the top right corner! Thanks for recommending!